In collaboration with Nemours Health Informatics (NHI), KidsHealth created a library of Patient Discharge Instructions, which are easily accessible to clinicians through Nemours’ electronic health record (EHR), EPIC. The patient instructions library continues to grow with topics appropriate for inpatient, outpatient, emergency department, and primary care use. In addition to helping patients achieve better outcomes with high-quality instructions, providing electronic copies of patient instructions is a core objective of “meaningful use” requirements. The Centers for Medicare & Medicaid Services issued meaningful use requirements that all providers must meet through their certified EHR to qualify for incentive payments. Developed in collaboration with Nemours pediatricians, pediatric subspecialists, pediatric surgeons, pediatric nurses, and other pediatric caregivers, the Nemours KidsHealth Patient Discharge Instructions will be written in parent-friendly language and will address the emotional issues families face, both hallmarks of KidsHealth content. A library of family-friendly medical illustrations was also created to help further distinguish these discharge instructions. 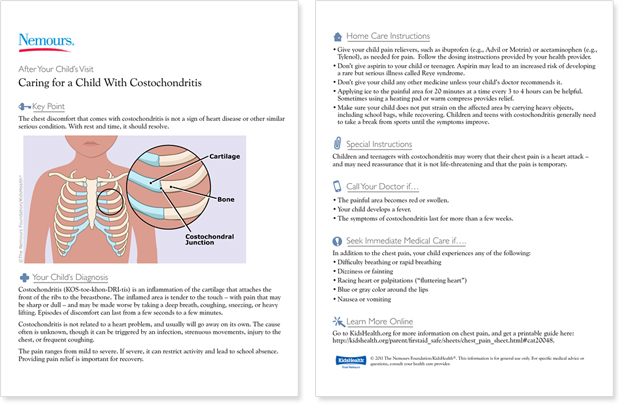 The entire library of discharge instructions, available in both English and Spanish, cover many hundreds of topics. This project represents a major commitment from our organization and showcases the unique assets of Nemours’ integrated health system: the many dedicated clinicians who treat our patients, Nemours Health Informatics, and KidsHealth. If you are interested in becoming involved in this important, ongoing clinical project, please contact Kate at (302) 651-5939 or kcronan@nemours.org.